All Members are encouraged to register on-line to ensure we have all player and parent information correctly entered. Contact your Team Mom if you are not able to complete on-line registration and require the paper forms. Orders and on-line payment for Season Tickets will be available soon for families that have already paid Touchdown Club dues or for fans that don't have a player. 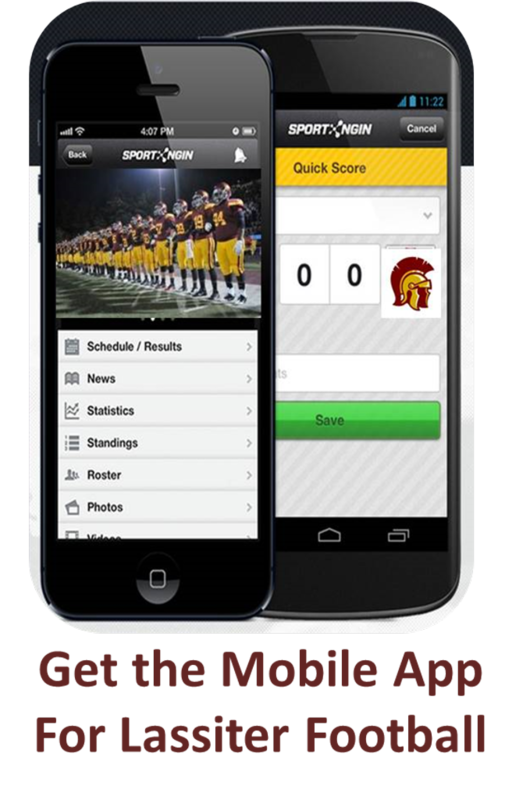 The Touchdown Club Team Page provides access to general news, photos and posts from the Lassiter Football Network via the Mobile App. Register here for youth programs sponsored by Lassiter Football. See the Jr. Trojan page for details. Several organizations in the Lassiter Community use Sports NGIN for their website and registration systems, such as Trojan Youth Lacrosse, Jr. Trojan Football and Sandy Plains Baseball. If you have an account with these programs use the following instructions to join the Lassiter Football Network. Log on the Lassiter Football website with the same username & password used to create the original NGIN account, such as Trojan Youth LAX. The system will automatically add your account to our network. See the small "Log In" button on top, left of the Home page to begin. You can shop at LassiterFootball.net with confidence knowing your transactions are processed by one of the most trusted names in the industry. We have partnered with Authorize.Net, a national leader in payment gateway services, to accept credit cards and electronic check payments safely and securely for our members. The Authorize.Net Payment Gateway manages the complex routing of sensitive customer information through the electronic check and credit card processing networks. The company adheres to strict industry standards for payment processing. The Lassiter Touchdown Club is registered with the Authorize.Net Verified Merchant program and proudly displays the Verified Merchant Seal. Providers of merchant services and point-of-sale support for Trojan Football. ©2019 Lassiter Touchdown Club / SportsEngine. All Rights Reserved.